Katherine McNamara Rallies PCAs Votes for "Shadowhunters"
Shadowhunters: The Mortal Instruments fans got the surprise of a lifetime last week when the show's leading lady stopped by our E! People's Choice Awards' food truck in New York City. During New York Comic Con, People's Choice Awards had their epic food truck make a pit stop in the city to share tasty donuts with fans and ask them to vote for their favorite stars ahead of the Nov. 11 live show. 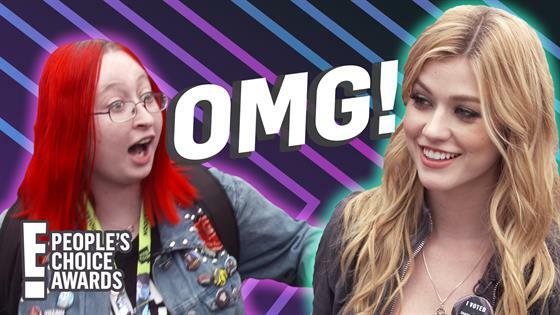 What fans weren't expecting was for Katherine McNamara to make a guest appearance! When then Freeform actress showed up at the truck she chatted with fans, gave out some delicious donuts and quizzed a few super fans on their Shadowhunters knowledge...all of which they totally nailed. Since the 2018 PCAs are just around the corner, we want you to check out McNamara's guest visit at the People's Choice Awards food truck above. Even if you weren't there you will feel like you were. Plus, there is still time to cast vote for McNamara for Female TV Star of 2018 or for her co-star, Harry Shum Jr. for Male TV Star of 2018. Oh, and Shadowhunters: The Mortal Instruments is also a finalist for Bingeworthy Show of 2018 and Sci-fi/Fantasy Show of 2018, so fans have a lot to vote on and celebrate right now. What are you waiting for? Voting ends on Friday, Oct. 19, so you need to hurry! Don't forget to hit up the PCAs food truck in either Austin or Los Angeles later this month as well.